As crews went to work to repair the stormdrain before paving my street, it seemed like another missed opportunity... especially as we have been working to promote our "Ocean Friendly Gardens" and green infrastructure solutions to urban runoff. These are an effective (but fairly expensive) solution for retrofit of existing storm drains. 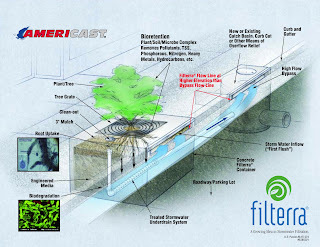 This company's website has a nice animated graphic showing how this works - capture and infiltrate "first flush" stormwater runoff (or your day-to-day flows like car washing or sprinkler over-spray) as well as trash and debris, while providing a bypass for higher storm flows.